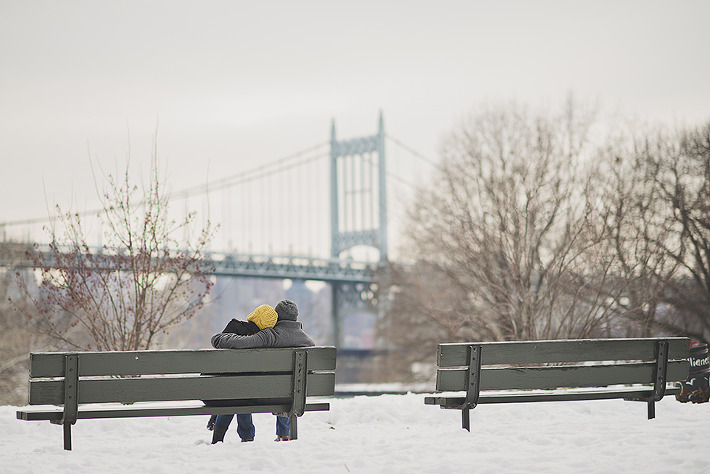 Today’s session spotlight features winter couple portraits at Astoria Park with an absolutely lovely couple that I am so pleased to have spent some time with. But let’s just talk about the location first. I used to live in Sunnyside when my girl Lana was a firstborn. I used to take her for walks that first spring at Astoria Park, but hadn’t been there in ten years. I was so happy to get to visit it again. As I told my awesome couple, I grew up in Indiana, so one of the things that always fascinated me about the city is city parks. I find them uniquely beautiful and I would visit as many as I could. This one, as many others in the area, have grand architectural features. These are such a treat for a photographer. I especially loved the huge arches. Then of course we had the perfect winter atmosphere, right down to the kids sledding down the hills, and it all made for a beautiful place to spend some time on a Sunday afternoon. But let me be clear, the real treat was the couple. I knew I liked them in the first two minutes of meeting them. They were excited for the session! And whenever my subjects are excited, I am excited because that almost guarantees a perfect session. The other thing that made me love them is they had big warm friendly smiles from start to finish. If you know me at all, you know that I often sport a goofy grin myself, so I let’s just say we got along famously. E & B where fun and up for anything. At one point I was pretty sure E was going to commandeer some kids sled for a sledding pic. Not so after all, but I have no doubt she could have pulled it off with charm. 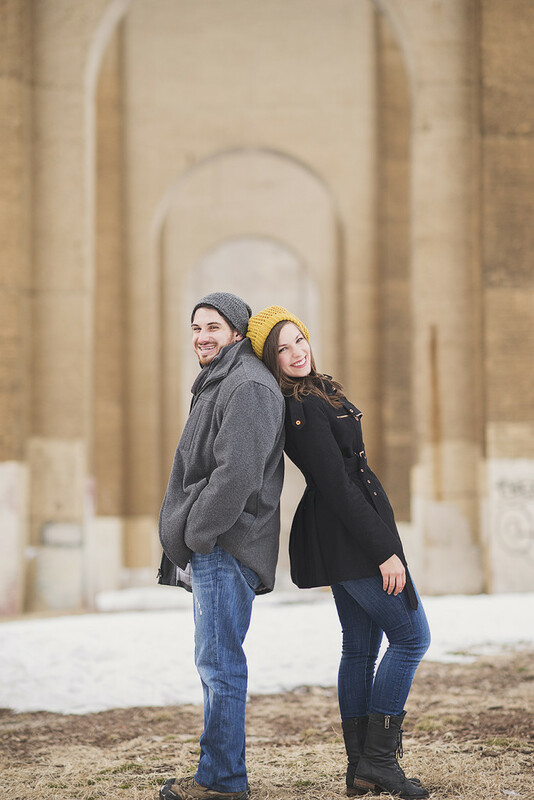 I could talk all day about the cute pair, but the better way to get to know them is to check out this awesome session of winter couple portraits Astoria Park. Here ya go. What did I tell you? Adorable, right?! I particularly love this last image. It reminds of a all those New York love story movies, especially in black and white. Two lessons you should take away from this session feature. First: E & B are a super cute couple and have years and years of adorableness to come. 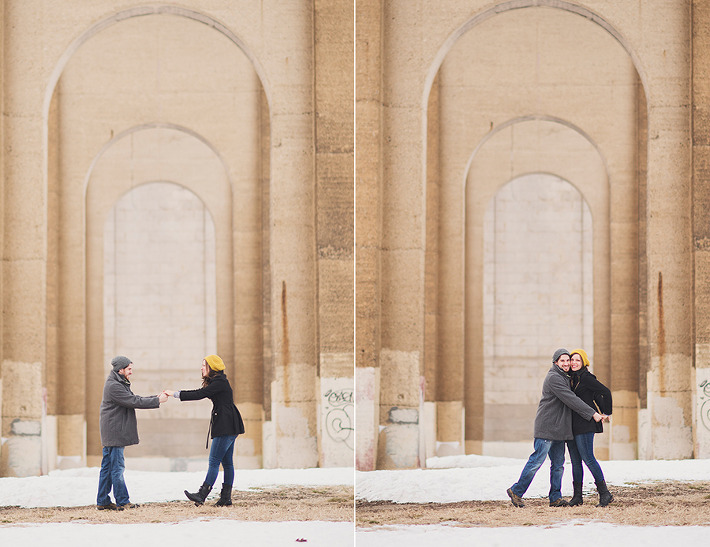 Secondly: Don’t be afraid of winter portrait sessions. Cold whether has it’s brand of beauty and it should be taken advantage of. As always, I want to thank you for stopping by and please come back again. Also, if you have a sense of adventure, hit the contact button above so we can chat about your very own winter portrait session. LeslieBrightEyes - Hi Shira 🙂 I am emailing you now with that info. LeslieBrightEyes - Thank you Anna!